March 30th, it went to number 4 on the iOS music app chart. As of this week, it's now ranks 51 on the music chart and 872 overall. Major rivals Pandora & Spotify sit in 1st and 3rd place respectively. When Tidal made its big media push at the end of March, the core message was clear: While other streaming music services like Spotify and Pandora pay a pittance to artists, Tidal offers musicians a better deal. Unfortunately, Tidal also opted to use super stars like Nicki Minaj and Beyonce as spokespersons for the app. The result was the ultimate mixed message: You should feel sorry about how little money Nicki makes. Less than a month into Jay Z's Tidal reign, the rapper is already effecting major changes. The streaming service has parted ways with Andy Chen, the CEO of Tidal's parent company Aspiro that Jay Z purchased. 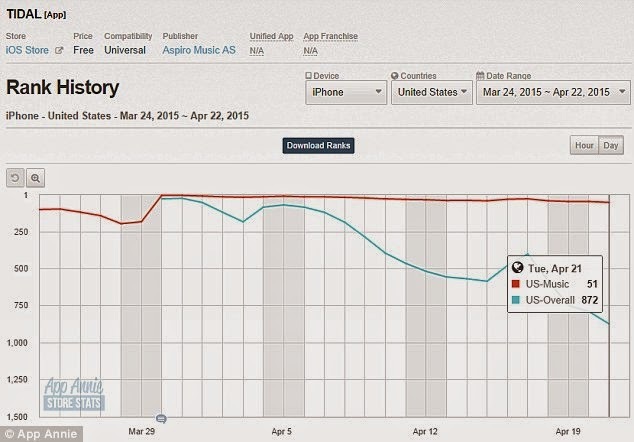 Two weeks after Tidal briefly cracked the U.S. iPhone top 20 download chart, the app has crashed out of the top 700. Apparently American consumers have limited empathy towards Beyonce and Nicki. 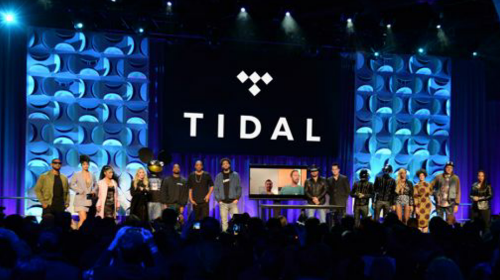 Soon after the launch fiasco, Tidal’s CEO was kicked out in a “streamlining” move. The new CEO Peter Tonstad, a former consultant for the Norwegian Ministry of Environment, has his work cut out for him. To make matters worse for Tidal, its main rivals are now surging. On April 20th, Pandora and Spotify occupied positions No. 3 and No. 4 on the U.S. iPhone revenue chart, respectively. This was the first time two music streaming services have hit the top 4 in sales simultaneously. In order to achieve the feat, Pandora and Spotify had to push out Candy Crush Saga out of U.S. iPhone top 4 revenue chart, which is a remarkable achievement. As a matter of fact, something curious can be seen in Spotify’s download performance right after Tidal media campaign started bashing its allegedly meager payouts. Spotify surged back into the iPad Top 40 download chart on March 31st, right when Tidal’s anti-Spotify invective hit fever peak in American media. This had not happened since November 2014. It looks like Tidal’s attacks on Spotify and Pandora actually managed to increase public awareness of the services, boosting particularly Spotify’s download performance at the end of March. And now, a few weeks later, the combined revenue performance of the two music apps is hitting a new milestone.